Shelby attended Oglethorpe University in Atlanta, Georgia, where she obtained a Bachelor of Arts in Sociology with a minor in Political Science. She then attended the University of Memphis Cecil C. Humphries School of Law where she was a member of the University of Memphis Law Review, the Moot Court Board, and the Christian Legal Society. Shelby served as Treasurer of the Federal Bar Association and Professional Liaison to the Tennessee Bar Association. She also earned CALI awards in both Legal Methods I and Legal Methods II, was a two-time recipient of the Dean’s Award for Excellence in Legal Writing, and was named a top five oral advocate in mock trial as determined by a panel of state and federal judges. During her third year of law school, Shelby served as judicial law clerk to the Honorable Gina C. Higgins, Circuit Court Judge for the Thirtieth Judicial Circuit at Memphis. 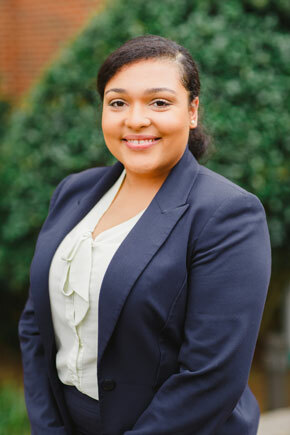 Upon graduation from law school, Shelby served as Research Assistant to the Honorable Cheri Beasley, Associate Justice of the North Carolina Supreme Court. There, Shelby gained invaluable legal research and writing experience by reviewing appeals and drafting memoranda on petitions for discretionary review. Shelby also assisted Justice Beasley with independent research of more than 500 cases from state and federal jurisdictions to determine whether courts’ rulings are consistent with a 2011 SCOTUS opinion and analyze potential policy implications. Shelby is originally from Memphis, Tennessee, but currently lives and practices in Charlotte, North Carolina. When she is not practicing law, Shelby enjoys spending time with her family, playing a number of music instruments, and participating in community service projects.